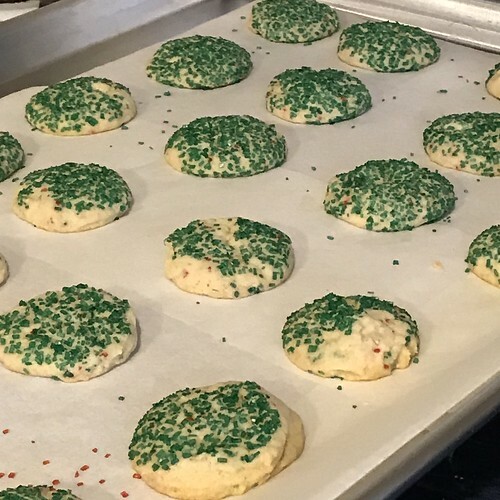 Today I made three batches of cookies for the freezer in preparation for our annual open house in December. 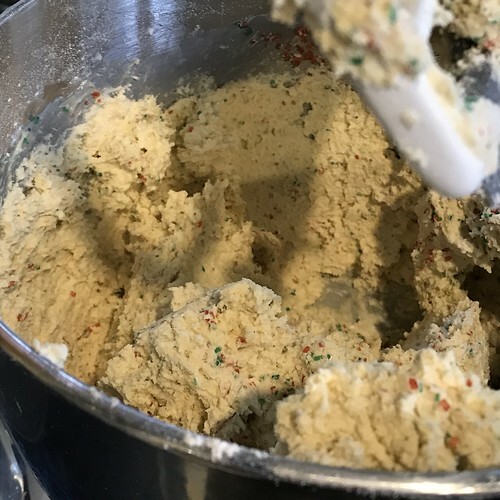 I made Holiday Oatmeal Icebox Cookies. I usually roll these into logs and roll them in green and red sugar. Today I just added coarse green and red sugar to the batter. I used a cookie scoop to form the cookies. 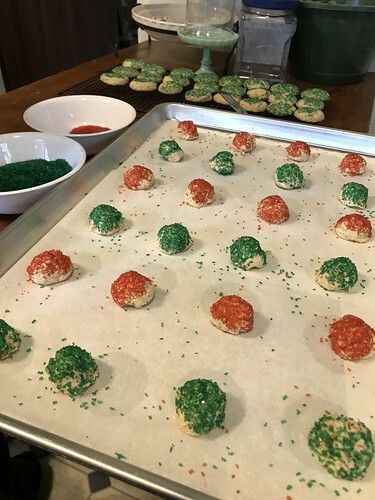 Then I dipped them in the same red and green sugar. I stored them between sheets of waxed paper in a Rubbermaid container. I also made Macadamia Nut Shortbread cookies. Besides the nuts, they have chopped white chocolate in them. They didn’t bake as nicely as usual. Flatter. But still taste great. 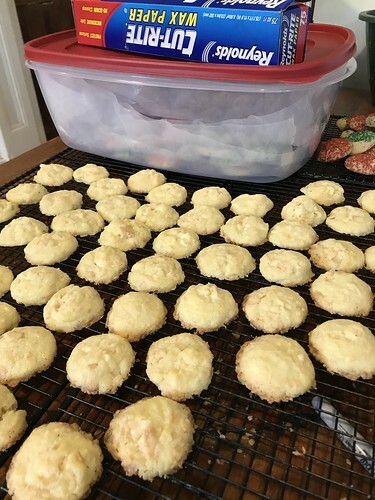 I stored them on top of the first batch of cookies in the same box. 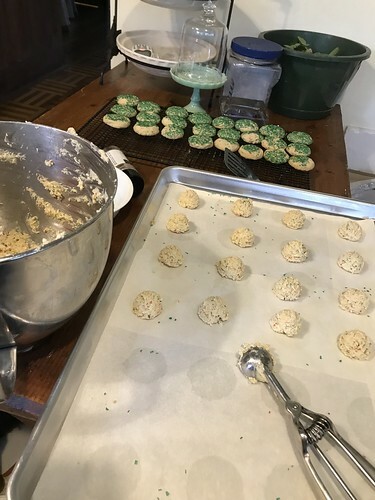 The last batch of cookies were the Elfin Bites, which are also a shortbread cookie. 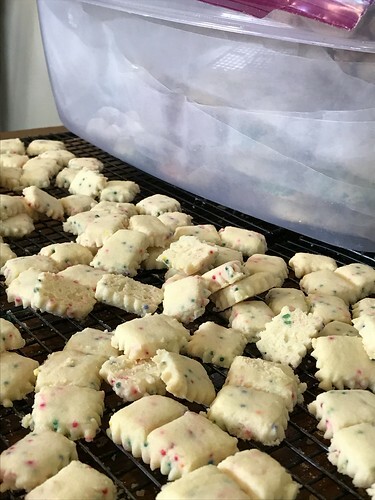 These are tiny cookies about an inch square. So good! 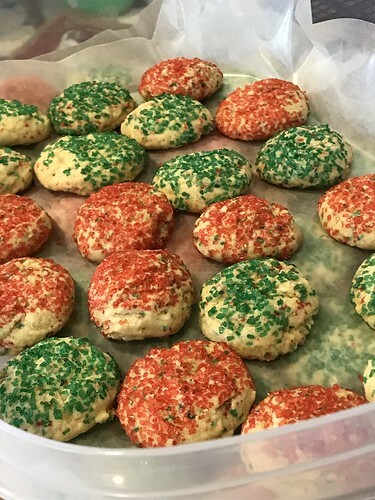 I put them in three ziplock bags and stored them on top the other cookies in the same container. Those are now in the freezer, waiting for Christmas! Next week, I plan to make Butterscotch Gingerbread Cookies, Sour Cream Sugar Cookies, and Peanut Butter Cup Cookies. 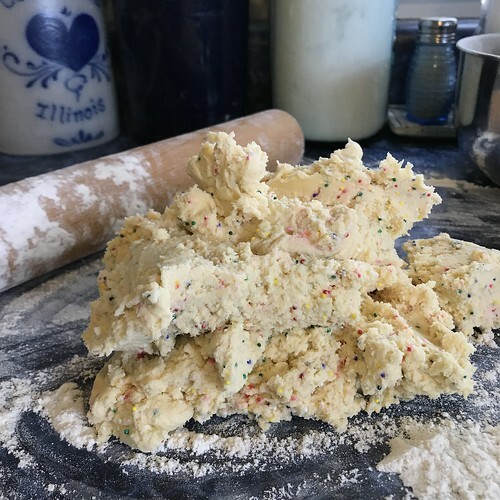 This entry was written by ~~Rhonda, posted on October 10, 2018 at 9:53 pm, filed under Christmas. Bookmark the permalink. Follow any comments here with the RSS feed for this post. Post a comment or leave a trackback: Trackback URL.